For other uses, see Torta (disambiguation). Not to be confused with Tart, Torte, or Tort. Torta (Spanish pronunciation: [ˈtoɾta]) is a Spanish, Italian, Greek, Albanian, Bulgarian, Maltese, Hungarian, Portuguese, Croatian, Swedish, Serbian, Macedonian and also Slovak word with a wide array of culinary meanings, such as a cake, or flatbread. In Spain and various countries of Latin America, the word torta, in a very common usage, is for sweet cakes (tortes), such as a wedding or birthday cake. This meaning is also present in other European languages. For example, the Italian torta, German torte or French tarte. In Mexico, the sweet cake is normally referred to as pastel, which is also used in other parts of Latin America with this meaning. Huevo en torta (not to be confused with torta de huevo) is a typical pastry from Sobrarbe, Aragon, Spain. In the southern Philippines, torta is generally used to refer to small cakes. It usually refers to mamón or torta mamón, a native porous sponge cake delicacy that resembles a large cupcake with butter, sugar, and/or cheese on top, traditionally served with sikwate (a thick, hot drink made of ground roasted cacao seeds) for afternoon snack or merienda. Torta in Spain originated in different regional variants of flatbread, of which the torta de gazpacho and torta cenceña are still surviving in certain areas of Central Spain. Tortas are also mentioned in Leviticus 24:5-9, in the Spanish translation of the Bible. Presently, however, the word torta is also applied to different kinds of bread and pastry products according to the region. Where there is no bread tortas are all right. In turn, in Mexico a variation says: A falta de pan, tortillas ("Where there is no bread, tortillas are fine"). However, the term "torta" in Mexico typically refers to a sandwich made with bread (see Mexico section, below, for more details). Torta frita is a fried flatbread eaten in Uruguay, Argentina and the Chilean Patagonia. In the northern Philippines, particularly among Tagalog-speaking provinces and islands, torta refers to a kind of omelette made with eggs or eggplant, ground meat (usually beef or pork), and sometimes minced onion and potato. Tortang giniling - an omelet with ground meat (usually beef or pork) and sautéed vegetables. Tortang gulay - an omelet with peppers, mushrooms, onion, and garlic. Tortang talong - an eggplant fritter. Torta de huevo is a small fried mixture of scrambled eggs, usually eaten sandwiched in bread. In Italian, “torta” means simply cake, however sweet or savoury. However, in the US, it came to have a different meaning within the Italian-American community. The Italian torta is differentiated from crostata by the filling: a crostata has an inconsistent chunky filling, whereas a torta has a consistent filling made of blended ingredients. Some falsely believe that an Italian crust torta is a combination of layered cheeses and tomatoes to be spread onto bread. Italian torta is a pie similar to quiche and served as a brunch item. However, torta is different than quiche as the crust is mostly made of cheese, not egg. The crust can also be made from pizza dough. Ingredients vary as there are many variations of this torta. Traditional Italian torta usually includes ricotta cheese, parmesan, parsley, and onion. 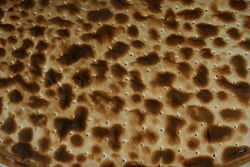 There are also variations that contain meat and some that are completely vegetarian. These vegetarian torte sometimes contain artichokes and spices for flavor. This torta is made in a springform pan instead of a traditional pie pan. Torta in Brazil and other Portuguese speaking countries refers to a pie which can be a sweet or savory dish. Torta in Malta means a pie, which can be sweet or savoury. Most “tortas” are generally savoury, with a classic Maltese dish being “torta tal-lampuki” (lampuki, singular lampuka, are a type of common fish found in Maltese waters). A common example of a sweet Maltese torta is “torta tal-lewz” (lewz, singular lewza, means almonds in Maltese. Almonds are a very common ingredient in Maltese cuisine, although some people prefer to use marzipan over almonds, either because of ease, taste preference or cost. In Argentina, Chile, and Uruguay, people typically refer to dessert cakes as "tortas." In Mexico, a torta is a kind of sandwich, served on an oblong 15 cm firm, crusty white sandwich roll. Depending on the region, this is called a bolillo, telera, birote, or pan francés. Tortas can be eaten cold or hot, and grilled or toasted in a press in the same manner as a Cuban sandwich. Garnishes such as avocado, chili pepper (usually poblano or jalapeño), tomato, and onion are common. The dish is popular throughout Mexico, and is also available anywhere with a large Mexican population. In Northern Mexico, the torta is very frequently called lonche by influence of the English "lunch", as it may be eaten during lunch break. 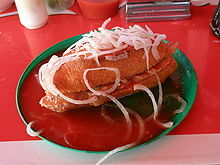 The torta ahogada (meaning "drowned" torta) of Guadalajara is smothered in a red sauce. Different fillings are available and they may be mixed to create an original torta. The Torta Cubana is another take on the classic torta sandwich Mexico has been accredited for. As the name implies by meaning literally the "Cuban Torta", this sandwich is stuffed with a variety of meats that is dependent on where it is being made. This sandwich should not be confused for the Cuban sandwich by the similar name, the "Cubano" as the two sandwiches are not related. One may have come before the other, but this coincidence in names is not to be taken seriously as the Mexicans decided to name this dish after the street it was invented on, the Calle Republica de Cuba in Mexico City. To add on to the contrasts, the breads used to make the sandwiches are different, and the condiments of the sandwiches varies. The origin of the torta is unclear, but some claim it sprouted in Puebla due to Spanish-French interaction. Teleras (the bread usually used in tortas) were inspired by French baguettes. Tortang talong is an eggplant omelette commonly served for breakfast or as a side dish for other meals. Torta del Casar, a cheese made from sheep's milk in Extremadura, Spain. ^ "Torta Mamon Cebu Recipe". Choose Philippines. Retrieved 10 December 2018. ^ "Learn how to cook Cebu Torta Cake Recipe". Pinoy Recipe at iba pa... Retrieved 10 December 2018. ^ "el Gazpacho Manchego". Albacete. ^ "Torta Cenceña - Portal Turístico de La Roda - Ayuntamiento de La Roda". www.turismolaroda.com. ^ "History of Filipino Food, Spanish Influence". myfilipinokitchen. My Filipino Kitchen. Retrieved 12 February 2015. ^ Merano, Manjo. "Tortang Giniling Recipe". Pansalang Pinoy. Pansalang Pinoy. Retrieved 12 February 2015. 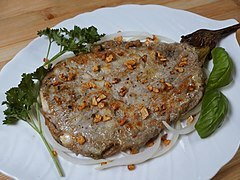 ^ "Tortang Talong Recipe". Pilipinas Recipes. Pilipinas Recipes. Retrieved 27 October 2018. ^ Capatti, Alberto; Montanari, Massimo (2003) . Italian cuisine. Arts and Traditions of the Table Series. Translated by Áine O'Healy. Columbia University Press. p. 60. ISBN 0231122322. ^ Ellis-Christensen, Tricia. "What is an Italian Torta?". wiseGEEK. wiseGEEK. Retrieved 19 February 2015. ^ Peach, Lucky (3 September 2014). "On Tortas Cubanas". ^ Alaniz, Leticia. "Tortas - The Mexican Quintessential Sandwich". Leticia Alaniz. Retrieved 12 February 2015. ^ "History of the Torta". bolillotortas. 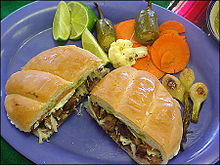 Bolillo Tortas. Retrieved 11 February 2015. Wikimedia Commons has media related to Torta (flatbread) and Tortas (sandwich).